The amount of water your landscape requires and receives will determine its overall health and beauty as well as its ability to withstand normal use and drought. Proper watering techniques are a critical part of landscape maintenance; the main things to known include Knowing when to water, how much to water and for how long. Remember that over watering a plant can kill a plant just as quickly as under watering. The signs of over watering and under watering can actually look the same. When a plant is too dry it will wilt because the plant does not contain enough water to support its structure. A plant that is over watered will also appear to be wilted but in fact the plant has absorbed too much water and cannot release it quick enough to return to its natural upright state. 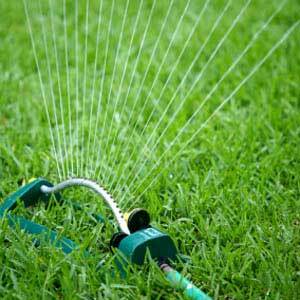 Begin watering new sod within a half hour after it has been laid. Water to a depth of 1 inch so that the soil beneath the turf becomes saturated. The soil below the surface should be moist 3-4 inches deep. For the next two weeks keep the soil surface moist with daily watering. Additional and more frequent watering may be needed during periods of high wind. Watering early in the morning when possible will allow the new sod to absorb moisture more easily as well as lessening the loss of water due to evaporation. One inch a week is the standard water requirement established for most lawns; however, this will vary between grass types. There will also be different water requirements for different seasons as well as different soil types. During the growing season most lawns will survive with at least one inch of water per week, this being from rain or from a homeowners water source. When applied properly this amount of water is all that is required for a healthy lawn, making sure to water evenly and to saturate the underlying soil to a depth of 4 to 6 inches. You may need to calculate the amount of time it takes to accumulate this amount of water to the desired depth. Try using an old coffee can or some other container that can be marked, place this can at each station or desired area to be watered, set the sprinkler to run until you have accumulated one inch of water in the can, this lets you know how long it takes to water to a depth of one inch. Infrequent and deep watering is best because the roots will only grow as deep as its most available water supply. Deeply watered lawns have a larger water source that allows it to survive for longer periods between watering. Examine your lawn to determine its water needs. Grass that needs water will have a gray green color to it. Also look as you walk across the grass, you shouldn’t see your foot prints in the yard after 20-30 minuets, they should disappear within in a couple of minuets. Water all newly planted Trees & Shrubs immediately after planting. In order to become established, most newly planted Trees & Shrubs require regular watering for at least six months to one year. Again deep infrequent watering is the key to establishing a healthy deep-rooted plant that will require less water over time. Concentrate the water to the area around the root ball rather than on the leaves, this allows for quicker absorption through the root system instead of the foliage. 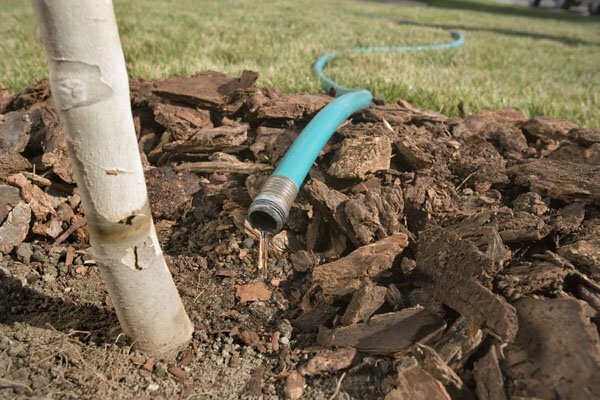 The use of “Gator Bags”, soaker hoses, or drip irrigation can help lessen the need for frequent hand watering of large newly planted trees or shrubs by emitting a slow continuous stream of water directly to theroot system. Watering at night can increase the chances of fungal related problems, with the foliage staying wet all night.Watering in the early morning allows the plant to dry completely through out the day. It also allows the plant to more readily absorb the water with less chances of water loss due to evaporation. Different plants have different water needs, some are quite drought tolerant while others are not. Plants with large leaves such as hydrangeas or azaleas with shallow root systems are usually the first to suffer during long periods of drought. Shrubs under large Trees are susceptible more so because of the large volumes of water taken up by the Trees large root system. New plants are more apt to suffer from drought during their first two growing seasons. Late spring or summer transplants are the most susceptible, because their roots have not had sufficient time to become adequately established before summer stress. When there is an extended period without rain, new plants should be watered at least once a week. Soaker hoses are ideal for watering large shrub beds and “Gator Bags” for large Trees. They release water slowly and economically. They do not wet the foliage, thus less chance of fungal development. 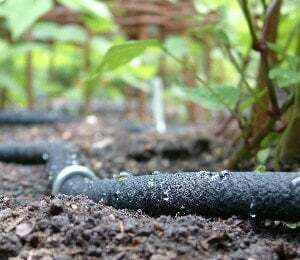 Many gardeners leave the hose in one location for an entire season or longer. You can use automatic sprinkler systems also, but be sure to calibrate the amount of time it takes to adequately water every location. Established Shrubs should be watered to a depth of 10 to 12 inches deep at least once a week, this can take up to 2 hours of continuous irrigation. Allow the soil surface to dry out lightly between waterings. The majority of root development will be at greater depths where soil moisture is higher. For established Trees and Shrubs, watering should be done every 7 to 10 days during prolonged periods of drought or dry spells. During cooler seasons, less watering is needed because evaporation from the leaves occurs more slowly.